Altered Eras: Classic Book Necklace Giveaway ! Classic Book Necklace Giveaway ! Win a Classic Book Necklace of your own. Choose from Wuthering Heights, Jane Eyre, Pride & Prejudice & Dracula. Featuring an originally designed pendant (by Altered Eras) manufactured in cream coloured acrylic to represent a vintage book. On 1 'page' is the iconic quote from whichever is your choice of novel and the other shows the relevant title of the book & author. These are printed using quality methods directly onto the acrylic meaning they won't peel or scratch off; giving you an incredibly hard wearing, unique necklace. The pendant measures approx 35mm x 22 mm. I have surely attached an antique bronze plated bail & it hangs on a bronze plated etched cable chain of 17 inches. I have included an extender & little bronze key charm at the end to complete. It fastens with a bronze plated lobster clasp which allows the necklace to be clasped along the chain to be shortened if necessary. So pretty with a touch of steampunk drama! A truly unique piece that any fan of The Classics would be proud to wear ...This original design is under the ownership of Altered Eras & has UDR with Intellectual Property Office. Anyone can enter - I will send internationally to Europe, USA, Canada, Australia & New Zealand. Number1 - Browse my Etsy Shop and tell me what your favourite item is and why. Please post this here along with your choice of pendant (above) should you win. Number3 - Share my Giveaway on Facebook. Number5 - Tweet about my Giveaway. There will only be one randomly picked winner for the necklace prize & it will be picked using a random number generator (each entry will be issued with a number). Each thing you do is equivalent to one entry, so there is a maximum of 6 entries! If you do all 6, please leave 6 separate blog comments to indicate each one! The Giveaway ends on Wednesday 14th November at 8PM GMT. I will be contacting the winner over he next few days (before sunday) so please check those inboxes !! Winner will be randomly picked (using a random number generator hence the need for separate comment for each entry ) and announced by Sunday 18th, and will have one week to respond to my initial email so please ensure that there is a way for me to contact you by - Facebook, Email, Twitter etc... Good Luck! If I need a necklace now or I dont win - can I buy one? Just visit my Etsy shop & the literary lovelies section to see all the literary styled items I make. NB - Altered Eras reserves the right to extend the expiration date of the giveaway. Hey I'm entering! I like the skeleton key charm bracelet best on your store but you've got some neat stuff! The Jane Eyre necklace is my first choice. I also followed you on Twitter and I tweeted about it. Check out my classic book reading project too, at http://6years45000pages.blogspot.com. If I win you can contact me through that page using the "contact me" form! I would love to win the P+P necklace and my fav item in your shop at the moment is wedding favours http://www.etsy.com/listing/102802169/wild-flower-seed-favor-favour-wedding - just such a fab idea. I love this one: http://www.etsy.com/listing/95295799/leather-book-necklace-steampunk-styled , gorgeous, but I'm a sucker for all things book. :-) My choice, should I win, would be Dracula. Thanks for all your comments & goodluck !! If I won, I would love the pride and prejudice necklace! Hi! I´m entering into your giveaway. I´ve been watching your Etsy shop and I have to say that all your stuff is simply wonderful!! so unique.. If I win, I would love the Dracula book pendant, because it´s one of my favourite novels and I love Bram Stoker´s books, I have rode many of his books..so awesome! Have a nice day! sorry for my bad english hehe. And Shared it on facebook! I love the Teapot Ring! I mean how could I not? I enjoy reading even more with a nice hot cup of tea! I'd pick the Jane Eyre necklace! I would choose Dracula if I win. I love the Vintage Glass Jewel Earrings Amethyst - PURPLE PRETTIES - estate jewellery - glamour party christmas - Ltd Ed - wedding. I love the contrast of the black and purple. I would choose the Pride and Prejudice necklace to give to my mom. if i win i'd like the jane eyre necklace. Love the vintage clock key necklace but all of your stuff is amazing! Would love to win the Dracula necklace!! I love the Pride & Prejudice necklace. I like the Peacock Feather Book Locket Vintage Styled Necklace - BRIGHT EYES. I love the design and color of peacock feathers. This one is also my favorite and my choice of prize should I win! Thanks for the giveaway! My fave item is the Bee necklace because I am sort of afraid of bees, but wearing this would conquer my fear! I'd love to win Dracula. I like the Wuthering Heights earrings, they're unique and fun. I love the classics, you're items are very creative! I'd choose the P & P necklace. I like the Dracula Bottle necklace and i would choose the very cool Dracula Bram Stoker Book Pendant..thank you!! Please remember that for all your entries to count they need to be separate comments. I shared on facebook and tagged you in the post. love the vintage opal glass jewel earrings! and I love the pride and prejudice book!! My favorite item in your shop is your Birdcage long necklace! If I were lucky enough to win, I'd love the jane eyre necklace! Oh my! You certainly know how to make choosing a favourite item difficult. ;) If I HAD to choose it would be the weeping angels inspired necklace as I am a bit of a Whovian. And your Dracula book would be my choice were I lucky enough to win! 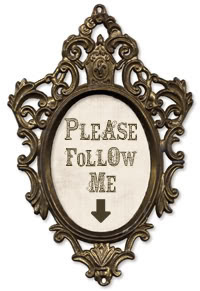 I follow you on FB (Leslie Anne) and I tweeted (night1836). Because I like earrings, and my fave colour is blue! Would love Pride and Prejudice. WOW! Your stuff is so amazing! I stumbled upon your giveaway and I am very very excited about your Wuthering Heights (my favorite novel of ALL time) necklace! I also am quite captivated by your Dr Who Inspired Weeping Angels Inspired Necklace - Keep CALM & DONT BLINK - bronze - Ltd Edition of 5. I am an American Dr. Who fan and thought the weeping angels idea in jewelry is just awesome! Love your stuff! Thanks for the chance to win! I shared your giveaway on my FB page! Now I follow you on FB as Gabriella Gősi. I liked your page on Facebook and I favorited your shop on Etsy. Love your lovelies! and if I'm the winner I like Pride & Prejudice Darcy Jane Austen Book Necklace, I love that book. Follow you on FB like Ananda Rock. Oh my, I love your shop! If I have to pick a favorite that isn't already included in the giveaway, it's the Wuthering Heights Diorama Shrine necklace. It's *so* beautiful, and so detailed for something so small! I dearly want the Jane Eyre book pendant. I love that line so much! I would love the Pride and Prejudice necklace! Hi, my favorite of all your lovely pieces is the Steampunk Pirate Telescope Keys Locket Necklace - THE PIRATE'S Chatelaine. I adore everything about it, the steampunk style, the keys and I find it amazing that this tiny telescope actually works!! If I wont, I'd love the Wuthering Heights Book Necklace British Steampunk Vintage Styled - HEATHCLIFF & CATHY so much!! 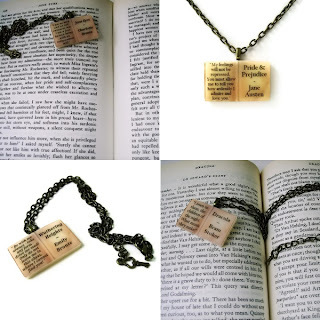 I would be ecstatic to wear a handmade piece that reminds me every moment of my favorite book. If I won, I'd pick the Wuthering Heights Book Necklace British Steampunk Vintage Styled - HEATHCLIFF & CATHY, of course!! The giveaway is now closed so any entries after this one will not be counted. I will be contacting the winner asap (before Sunday ) so keep checking those in-boxes !! I love the skeleton key bracelet. Thanks for the chance. Here is a feedback widget from my Etsy site - just so you can see my happy customers!! Art Nouveau - what is it?